In truth, it should probably be a Simple Spring Salad because of the asparagus, but I’m a little behind. And as the weather gets warmer, the thought of turning on the stove just becomes less and less appealing. And then I think of salad; cool, fresh, healthy salad. I heard about this particular salad from a British colleague based in Germany while I was in Boston. She assures me it’s VERY German. It was so painfully simple and delicious, I had to steal it and share it with you. 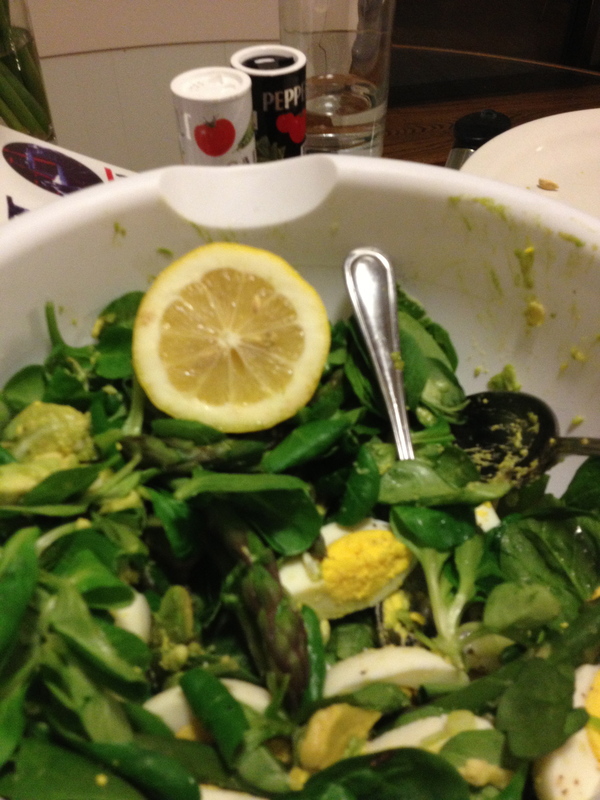 And most of the ingredients are already familiar to us: eggs, asparagus, avocado, lemon, and chives. Notice there’s no oil in this salad. The richness from the eggs and the avocado more than make up for it! The one new ingredient we’re approaching today is a lettuce commonly called mâche (mah-sh). It’s also known by several other names, including lamb’s lettuce, corn salad, and feldensalat. I first encountered mâche when I was working in Nantes, France where it was readily available everywhere. I’ve only just discovered recently that the bulk of Europe’s mâche comes from the area immediately surrounding Nantes! No wonder it was so plentiful and fresh! This mild, sweet, slightly chewy lettuce isn’t always super easy to find in the USA, but it’s gaining more traction. We’ve developed a taste for more peppery, bitter greens in this country, and there’s now an open space just waiting for milder options like mâche and butter lettuce. If you can’t find mâche in your area, you can substitute butter lettuce (more delicate texture), watercress (peppery), or even baby spinach. It’s probably best to hard boil your eggs in advance. If you haven’t hard boiled eggs before, it’s really quite simple, and a great trick to have up your sleeve. Check out how HERE. To blanch the asparagus, cook in salted boiling water for 2-3 minutes, remove and cool. You could also roast it, which is my personal favorite, but it takes away somewhat from the super clean flavor of this salad. Rinse and dry your lettuce and place in the salad bowl. Cut up your avocados as we’ve discussed previously. You could use the same dicing we used for our guacamole or you could opt for slices if you think it might be prettier. Quarter your peeled eggs lengthwise, and chop the chives very finely. Add everything to the lettuce and toss gently. Squeeze the lemon over the top using either a sieve or your hand to catch any seeds. Salt and pepper generously and toss again. And for heaven’s sake! Use a nice salt! Something flaky and delicate, like kosher or himalayan pink or fleur de sel! In addition to adding flavor, it’ll give a light crunchy texture. Fun fact: In its origins, salad was nothing more than greens seasoned with salt. In fact, the word “salad” comes from the Latin word for salt, “sal”. Given salt’s high value, Roman soldiers were also often paid in salt, resulting in the word “salary”. Now you know what it means to be worth one’s salt! Hope you’re all surviving this weather well! Best wishes from my short stopover in NYC! Next stop, Chicago and Green Bay!